The Sensei PRO 58-67mm Brass Step-Up Ring permits the use of 67mm threaded filters on lenses with 58mm filter threads. It features brass construction and is coated with a matte black finish to minimize reflections. Brass offers enhanced durability and resistance to warping over conventional aluminum rings, and is also less prone to jamming or binding to additional step-up rings, filters, or lenses. 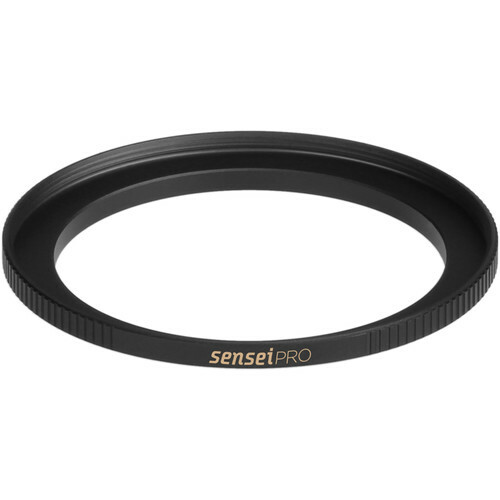 This step-up ring has large side knurlings to provide a more textured grip when mounting or removing it from a lens. Box Dimensions (LxWxH) 4.0 x 4.0 x 0.8"
PRO 58-67mm Brass Step-Up Ring is rated 4.7 out of 5 by 3. Rated 5 out of 5 by Rainbowrider from Brass is Best Nice addition for my Fuji HS50-EXR. Had a 67mm circular polarizer I wanted to use and the threads on this step up ring mesh perfectly. I would recommend this for the quality of materials used. Brass is by far the best. Rated 5 out of 5 by johntofva from Brass is the only good option. Very happy with this product. It eliminates the problem with binding using aluminum made adapters.